I visited the VeeamON forum a couple of weeks ago and wrote a post on Veeam Version 10 what’s new. One of the other interesting sessions at the event was a presentation on best practices to ensure Veeam Performance Optimisation. I made some notes during the session that I wanted to share to help you get the best performance from Veeam. Forward incremental was recommended as the best general backup mode. In this mode an initial full is created with the first backup, then incrementals for all future backups after this time. Reverse incremental were recommended for long backup chains, but since the most recent backup point is always a full created by injecting the changed blocks this is an I/O intensive process and slower versus forward incremental. I have found that jobs which suffer from slow merge times can be improved by scheduling an Active Full. Whilst clearly the Active Full will take some time the incremental backups will no longer require a merge and be much quicker. Within the proxy server settings you have a choice of several different transport modes which determine how the data is copied. They are listed below in order of speed from fastest to slowest. Consider the performance characteristics of the storage you are using for your repository. RAID choices were mentioned, if you are using a modern storage system things are not going to be so simplistic as changing RAID types to improve performance. My take home from this point was just make sure your particular storage is optimally configured. Also be sure to check out this Webinar I did with Veeam covering optimising 3PAR performance. Allows you to assign backup proxies to specific repositories. This could be useful to ensure the proxy in the correct geographic location is used or to ensure proxies with the best connection speed to a repository are utilised. 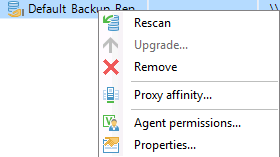 This is set by right clicking a backup repository and choosing proxy affinity. 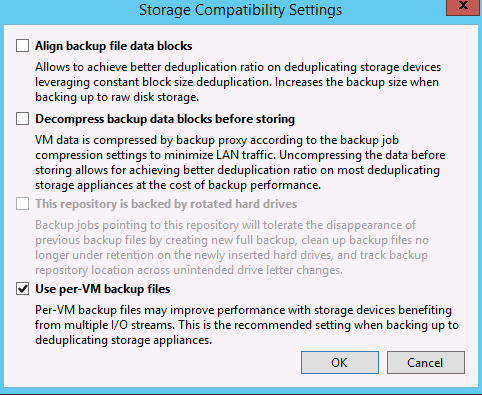 Prior to Veeam version 9 a single backup file was created for all the VM’s in a job when creating a recovery point. Per VM backups chains, means that each VM in a job creates its own backup chain. The positive impact of this is that more writes can be processed in parallel allowing for greater throughput. This feature is enabled at the repository level within the advanced repository settings. This may seem counterintuitive to limit the storage repository but once any storage device becomes over busy and writes start to queue performance can degrade exponentially. By limiting the throughput in cases where high latency has been seen, it may in fact allow writes to be committed in a more timely fashion. This is set in general options and can be seen in the screenshot above in which you set a latency threshold in ms above which the setting kicks in. Which stands for Resilient File System is the name for the new Windows file system introduced with Windows Server 2016. 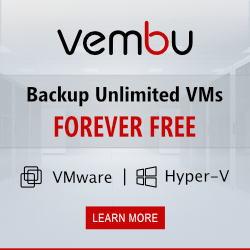 When integrated with Veeam it offers the opportunity to significantly reduce the time backups take. 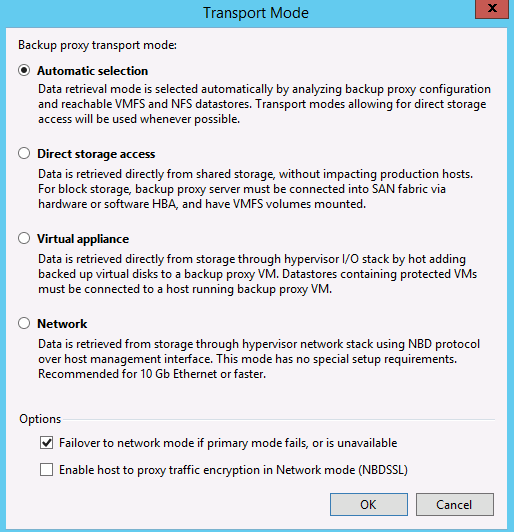 Synthetic full backups and the Veeam transform process require a significant amount of moving blocks around to create the backup file. This is an I/O intensive process and takes time to complete, relative to the performance of the underlying storage. When using ReFS the physical movement of blocks is no longer necessary, by harnessing the MS fast cloning capability pointers are simply updated. If you want to learn more about Veeam be sure e sure to check out The VeeamON Virtual Tour. This is a free online event in which you can learn the latest information about data protection and specifically Veeam. Like the article but one item to note is that Direct SAN Access can also be over iSCSI also. Using a physical or virtual. Thanks for the info. I have updated the post to reference that physical of virtual can be used, although physical is the recommended option.